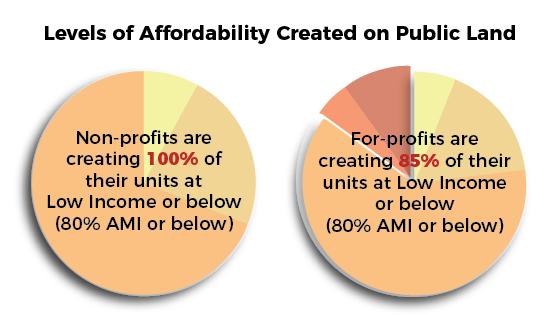 ANHD uses newly available data to evaluate these questions in our latest white paper, The For-Profitization of Affordable Housing Development and the de Blasio Plan. Using information from the recent implementation of New York City Local Law 44, which requires developers to report certain project details, ANHD analyzes the for-profitization of affordable housing and compares some aspects of the relative role and the public benefit of non-profit and for-profit developers in Mayor de Blasio’s Housing New York Plan. 74% of new-construction deals were by for-profit developers, while non-profit developers accounted for just 26% of new-construction deals. For-profit developers produced 80% of the new-construction units, while non-profit developers produced 20% of the new-construction units. Non-profit developers accounted for 54% of preservation deals, and for-profit developers accounted for 46% of preservation deals. Despite closing more deals, mission-driven developers produced 43% of the preservation deals, creating a discrepancy between the scale of projects between for-profit and non-profit developers. Between January 2014 and June 2016, 9 out of 10 RFP-selected new construction projects went to for-profit developers. Of those deals, non-profits developed low-income units at a rate of 15 percentage points higher than for-profits, with non-profits developing 100% of their units for low-income households. From January 1, 2014 to June 30, 2016, non-profits built 94% of the total number of deeply affordable new construction units, compared to 84% built by for-profits. 80% of the new construction subsidy was allocated to for-profits and 20% allocated to nonprofit developers. 57% of the total preservation subsidy went to non-profits and for-profit developers received 43% of the preservation subsidy. And listen to the in-depth coverage of the paper on The Brian Lehrer Show Tuesday morning. *An earlier version of the report had the incorrect version of Table 4B on page 15. It has since been corrected. This is the correct version of the report.